Product #21440 | SKU 9340 | 0.0 (no ratings yet) Thanks for your rating! The Monitor 8 from MOTU is a single rack space 24 x 16 x 8 monitor mixer, 6-channel headphone amplifier and a USB 2.0 audio interface with industry-standard AVB networking for sub-millisecond network latency. The unit mixes 24 physical channels, multi-channel computer audio, and 64 AVB audio network channels to eight stereo bus outputs (Main, Aux, and monitor groups A-F). Each group output provides multiple mirrored outputs, which can be fed to in-ear monitoring systems or other stereo destinations. The Monitor 8 connects to a computer through USB 2.0, which provides more than enough bandwidth for the twenty-four channels, and, when connected through AVB networking, supports hundreds of network channels. All devices on an AVB network can stream audio to and from a computer, and everything can be controlled simultaneously from any computers, tablets, and smartphones connected to the network. 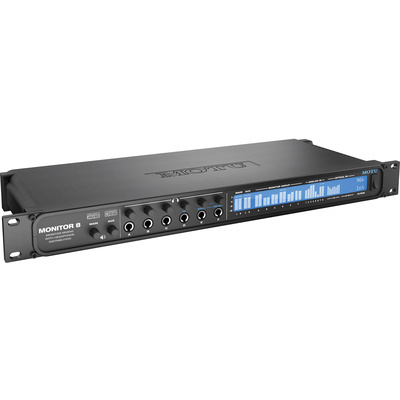 The interface delivers excellent analog performance with digitally controlled analog trim on the analog inputs, and includes a forty-eight-channel software mixer modeled after large format mixing consoles, DSP effects with 32-bit floating point precision, flexible matrix-style routing and splitting, stand-alone operation, and Wi-Fi control. Note! Windows support to be added later.